Realm: Erqua is a realm made up of a spiritual, nature-loving people who focus on respecting, preserving and being one with life and nature. Profile: Priestess of her tribe. Daughter of the high priestess Morowa. Height: 5 Ft 4” Eyes: Green Hair: Dark Brown. Personality: Benevolent, helpful, dedicated, determined. 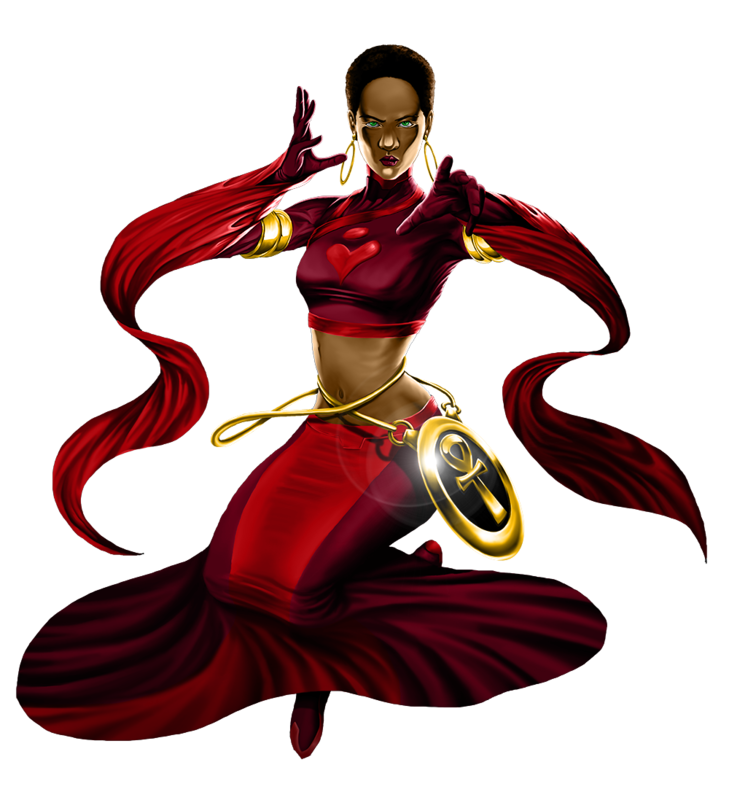 Abilities: Okira has the ability to manipulate substances down to a molecular level. This makes her extremely powerful. She primarily uses her abilities to heal and to boost the abilities of her teammates. Legends of Erqua say that their goddess Olykun created New Genesia to be her crown and then pulled Erqua out of the waters to be its crown jewel. Her enemy Daunub envied her creation and threatened to destroy it. However, the goddess has promised to always raise up a protector who will preserve her creation. When Okira's mother Morowa was a little girl she had a dream in which she was visited by Olykun who promised her that she would give birth to a special child. She was told to name the child Okira (Oh-kee-rah) and that one day the child would become the hope of New Genesia. Being from Erqua, a spiritual people, she believed it and kept the vision close. When Okira was born she had green eyes. Her mother took this as a sign that her vision was fulfilled and named her Okira. When Okira was a little girl, she miraculously escaped many dangers. Her mother believed it was the evil god Daunub attempting to kill the child. One day Erqua suffered devastating floods. Okira was swept away by a giant mudslide and was almost killed. Her mother risked her own life to save her. The incident left her mother Morowa blind. Morowa is the High Priestess of Erqua and being the daughter of the High Priestess, Okira has dedicated her life to learning the ways of her people. She believes in the sanctity and balance of life. She is also trained as a healer and is versed in all the natural healing substances found in Erqua. Okira, it is believed, is the fulfilment of the ancient Eruqan prophecy. She is the protector that the goddess would raise up to save her creation. Okira, however, sees herself as an ordinary individual who simply wants to keep her family and people safe.